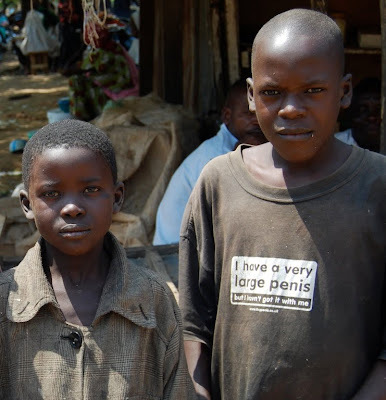 When T-shirts are donated by Western charities to Africa, there can be unfortunate/hilarious consequences. These kids were photographed in Nasarawa recently.. This is unfortunately funny. I was always uncomfortable when a former house help donned her favorite tee shirt with"deep-throat doctor" boldly written across the chest... same situation, I guess. LOL @ Deep-Throat Doctor! OMG! Lol... You should watch the documentary on how these shirts gets to Africa, and the huge market niche they occupy. Pretty interesting. The documentary is called "t-shirt travels."